The Event will take place on May 30 2016, 09.00 am at Hyatt Regency Thessaloniki Hotel. 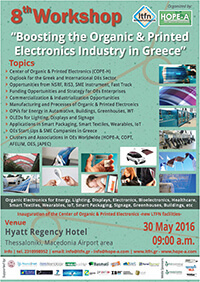 This exciting event will also include the Inauguration of the Center for Organic & Printed Electronics - Hellas (COPE-H). The Workshop targets to form the Strategy and Policy to boost the Organic & Printed Electronics Industry in Greece and beyond, with the participation of scientists, engineers, industrial partners, final users, enterpreneurials, VCs and representatives from national authorities. 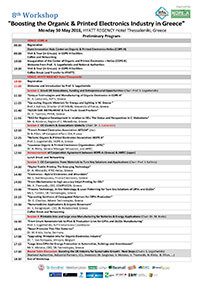 Below you can find the event's poster and the Workshop's preliminary agenda.